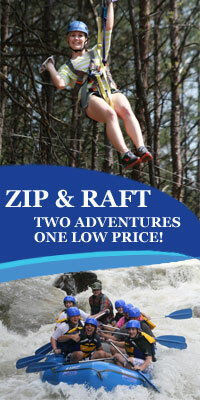 Rafting down the Ocoee River is a fun and thrilling experience no matter your party’s size. We can’t deny it, though — groups do have an amped-up experience when they’re soaked to the bone and paddling down rapids like Broken Nose or Table Saw with their friends, extended family and teammates from work. We make it easy at Raft One for groups to head down the Ocoee River together with our rafting packages for groups of 15 or more. So leave your flip-flops at home, put your sunglasses in the car, and wear your swimsuit. It’s time to get wet! Just don’t forget to book your trip. Give us a call at 1-888-RAFT-ONE for help planning your group rafting trip, and for information on rafting specials, deals and discounts for your group. Or, simply ‘Book Now’ to see immediate availability for the 2018 season. 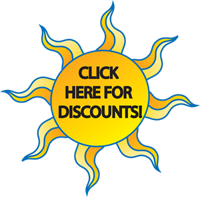 For Group Rafting rates & pricing, see our Ocoee Rafting Prices. A dunk tank doesn’t fit through your office door, so what better way to douse your small company’s team in water than a voyage down the Ocoee River? Kidding aside, team-building trips on the Ocoee river in Tennessee are excellent for helping your team bond outside the workplace. White-water rafting also requires communication. While our expert guides act as your leaders, they also depend on your party to work together as you paddle down the rapids. It’s an exciting trip d­­­own the Ocoee River, and that helps everyone on your team relax and have some fun with one another. Team-building has never been so fun…the guides were very professional and did a fantastic job. We had an absolute blast! If you’re looking for family fun in Georgia or Tennessee, make a pit stop with your extended family at Raft One to create a set of unforgettable memories. Our rafting packages for groups, as well as our experienced guides, make it easy to keep your party together. And if your family wants to take our full-day trip down the Ocoee River, our air-conditioned lodge is ready to lull you to sleep after a day on the rapids. Rafting is built on teamwork. Paddling by yourself isn’t all it’s cracked up to be — trust us. Get your youth group and bring them to Raft One for an experience of fun and fellowship they’ll never forget. It’ll also be comical if our guides’ jokes hit your funny bone. Before every run on the river, we give a 15-minute safety demonstration, so everyone stays safe on the water. Plus, we provide everyone with life vests and a wet suit if you’re visiting during the cooler months. Once you see the fun your group’s having on the rapids, you may decide Raft One is the place for your annual trip. — and cut the spoilers! 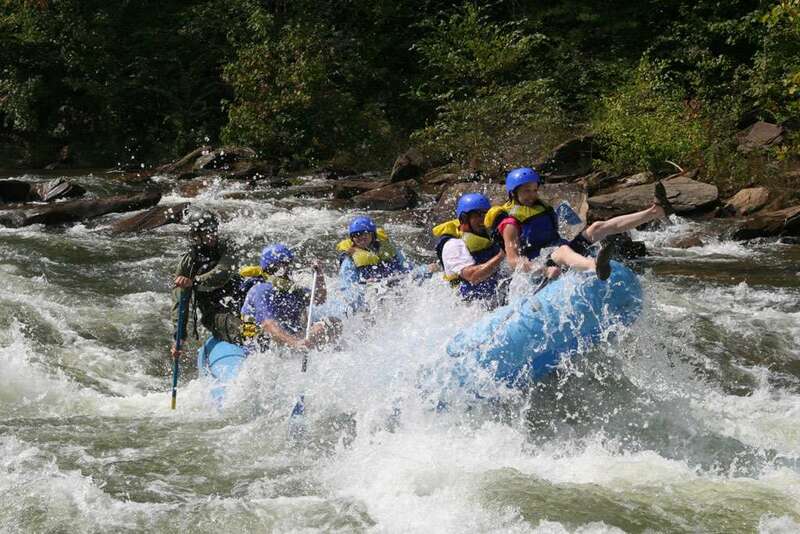 Whether you’re looking for some team-building recreation, family fun or more, our rafting packages for groups make it easy to travel down Ocoee River together. At Raft One, our white-water rafting group packages for 15 or more people include a five percent discount. We also offer combo trips which can include lunch, zip lining or mountain biking. It’s the ultimate team-building trip for a fun adrenaline rush and lasting memories. Looking for many activities to do with your group, we can keep you entertained and keep the team-building going for days! DAYS? Yep, Raft One has plenty of team building activities like Ropes Course, Ziplines, Waterfall hikes and swims, Mountain Biking, and more for your group to enjoy. Feeding the troops isn’t easy but our 5 star menu of catering will make for full bellies! Raft One’s catering service can provide just about anything you would like for any and all meals and occasions. Lodging large groups is extremely difficult… But not at Raft One, we’ve got you covered! Our lodges can hold your group and keep them warm or cool in our mountain style bunk cabins. The Lodges are much nicer than your summer camp cabins, but still with the bunk beds! Book your trip today and get ready to raft with us. When you’re more than 50 strong, fitting your party into an amusement park isn’t easy. At Raft One, our rafting packages for large groups make it easy to have fun and excitement during your family reunion, school field trip or team-building sessions. Plus, you stay cool. And dry? Guess again. Take the plunge down the Ocoee River, which features 30 named rapids, for the most unforgettable experience by booking your crew’s trip today. Try out the Canopy Tour, while you are at it, where your team can connect in the treetops, zipping from tree to tree. Get tangled and tested on the Challenge Course, making your team solve fun and technical low ropes elements. Also, we can lodge and feed the group here on the property. Most 2 day trip range between $95 – $160 a person. Companies love to bring their teams to Raft One for a few reasons. One, we provide a team-building experience. Two, we offer a fun environment. Three, we give co-workers a chance to bond and become a team inside and outside the workplace. It’s also an excellent way to celebrate company milestones, like reaching a certain amount of sales or achieving a Certificate of Excellence on TripAdvisor. Yes, we inspired that last example. A venture down the Ocoee River is an exciting trip for large groups and can help you reach your goal of successful collaboration and communication among your team. If you’re looking for a great family vacation in Georgia or Tennessee, don’t pass up Raft1. We make it easy to host your family reunion at Raft One. Not only do we have two lodges, which can host 60 people, but we also have several campsites available. So, paddle through the Ocoee River during the day and then relax in your cabin for the evening. We’re one of the best family reunion destinations in Georgia because we provide a thrilling experience on the water, but also a place to stay when you and the rest of your party are worn out from a day on the rapids. Our knowledgeable guides also work to ensure your family experiences the rapids together. We require all rafters to be at least 12 years old, so if you’re searching for a new field trip for your middle or high school students from schools in Georgia, Tennessee, or even farther, it may be time to bring them to Raft One. Instead of standing in line at an amusement park, your class gets to be on the water, paddling through exciting rapids with their classmates. Our rafting packages for large groups can also include our combo package, which provides lunch. This way you don’t have to worry about finding a restaurant or other location to host your students. Many teachers bring their students to Raft One year after year because of the experience and our guides. For the past three years, I have been bringing middle school age students,” adding, “Raft One can’t be topped when it comes to handling our students. Besides having fun, our core goal at Raft One is to ensure your safety. That’s why we always go over safety procedures before heading out on the water and provide helmets and life vests, plus wetsuits during cooler months. 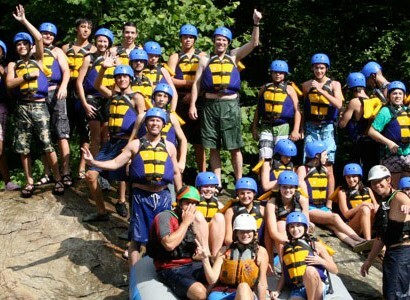 Book Your Large Group’s Rafting Package on the Ocoee River today! Our rafting packages for large groups offer you excitement, memories and steep discounts. For parties of more than 50 people, we provide a 15 percent discount. And if you’re bringing more than 100 rafters, we offer a different rate. Prepare to have the time of your life by booking your rafting adventure today! Want Photos of Your Group Going Down The Rapids? Prove you really did it. Don't forget to buy your photos. While you were on the river we took your photo at some of your favorite rapids!!! Check out these award winning expressions, and laugh at the candid moments. Don’t you need a little bragging rights? Professional Photographers At Work While You’re Having Fun! We have a photographer located on the rapids taking shots of your group. Click here to go to Digital Ocoee to find out more information and/or purchase.